NES Super Mario Bros. (JPN/USA) "maximum coins" in 26:10.25 by CuteQt, Tehh_083 & HappyLee. Once again, Bowser has kidnapped Peach, but this time Mario isn't trying to rescue her quite as urgently. Fed up with getting no reward for his endeavors beyond cake, Mario takes a leaf out of Wario's book and decides that while rescuing Peach, he might as well make as much money as he can. In this movie, the aim is to complete the game while collecting as many coins as possible without dying, doing so as fast as possible. 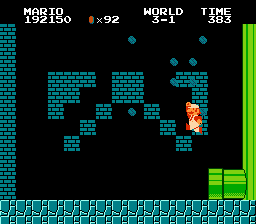 In fact, Mario collects 1431 coins in total, which is rather surprising as there are only 1225 distinct coins in the game! If you enjoyed this TAS, be sure to check out this movie, in which Mario completes the game without pressing the B button. Watch this run get played back on a real NES!